Over the last couple of months, a number of black writers have appeared in mainstream publications. The February issue of Vanity Fair included a short piece on Atlanta women writers, and poet Natasha Trethewey is pictured in a group of novelists. On March 9, the style section of The New York Times ran an image of poet Terrance Hayes. The March issue of Vogue magazine had a photo shoot featuring black male artists, which included Colson Whitehead. The April issue of Oprah's magazine O did a spread on contemporary poets, which included images of Rachel Eliza Griffiths, Camille Rankine, & Aracelis Girmay. Folks in literary and intellectual circles often express disdain for glossy, mainstream publications. I can get to that. Yet, no need to overstate the scorn with the fashion industry and popular magazines. As poetry critic David Orr explains, there is "a regrettable tendency to underestimate the wit and perceptiveness of the fashion industry." And, Orr notes, the fashion industry contains no less and no more silliness than the publishing industry. Beyond the problems, I'm thinking that there can be some value in the presentation of more and more black writers in popular publications. I wouldn't mind if audiences were more familiar with folks like Tyehimba Jess, Kevin Young, Treasure Williams, and Evie Shockley, to name just a few writers. Poets, general readers, and our admirably health-conscious First Lady Michelle Obama would certainly enjoy viewing images of the apparently always jogging and running poet, Allison Joseph. A while back, I started checking in on Joseph's twitter page to see if she was discussing poetry, and learned instead that she typically tweets to document her daily run times. "Ran 2.36 miles in 23 mins and felt good," she recently tweeted. "Ran 7 miles in 1 hour and 10 mins and 13 secs and felt good. Relaxed run!" she tweeted on April 8.
Who wouldn't benefit from witnessing more black writers (and runners) like Joseph? 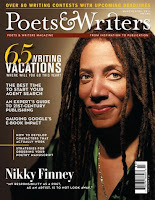 The cover of the March/April issue of Poets & Writers featured an image of Nikky Finney. It was a really welcome sight to see her presented on the cover like that, and I'm sure the image helped introduce her work to a broader number of readers.